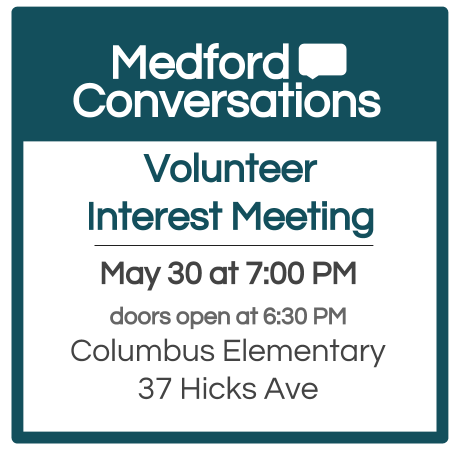 Are you interested in helping Medford become a more inclusive and thriving city? Do you believe facilitated small-group conversations can be a powerful catalyst for change? Consider joining us for a volunteer interest meeting on Wednesday, May 30th! We are always looking for additional help to deliver more inclusive, accessible, and meaningful programming. There are many ways to get involved. At our interest meeting you'll be able to shop around without commitment. We'll have representatives from each of our committees available to answer your questions. ​​Drop us a line at medfordconvos@gmail.com. ​Tell us about your interests and we'll put you in touch with someone who can answer your questions.